E. There is not enough information to determine. 3. Which of the following is/are true for a resting human? 4. A researcher has a black guinea pig and wishes to determine if it carries a recessive allele for white hair. Both of the guinea pig's parents are black. Which of the following would be the best method for the researcher to use? 5. A community includes seven different populations with various degrees of interbreeding. Population 1 shares genes only with Population 2. Population 2 shares genes only with Population 1. Population 3 has no gene flow with other populations. Population 4 shares genes only with Population 5. Population 5 shares genes with Population 4, Population 6, and Population 7. Population 6 shares genes with Population 5 and Population 7. Population 7 shares genes with Population 5 and Population 6. Which population(s) is (are) most likely to evolve after a change in its environment? 6. Which of the following could be reasons for infertility in a woman who is ovulating normally? 7. 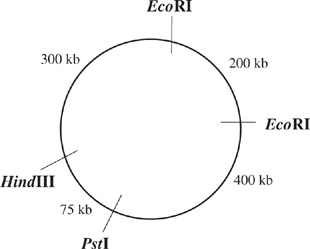 What fragments would be produced if the following plasmid were to be digested with EcoRI and HindIII to completion? 8. Human ABO blood typing is determined by the proteins present on red blood cells. The gene that codes for these proteins has three alleles: IA, IB, and i. IA codes for protein type A, IB codes for protein type B, and i codes for the absence of protein. IA and IB are codominant and i is recessive to both IA and IB. A woman with blood type A and a man with blood type AB marry and produce children. Which of the following blood types is NOT possible in their children? E. All blood types are possible in their children. 9. Which organism is the LEAST closely related to the others? 10. Which of the following organelles would be present in a eukaryote but NOT in a prokaryote? Which of the following represents the correct sequence of heart structures that blood would pass through when traveling from the right atrium to the lungs and then to the left ventricle? Which structures carry blood rich in oxygen? 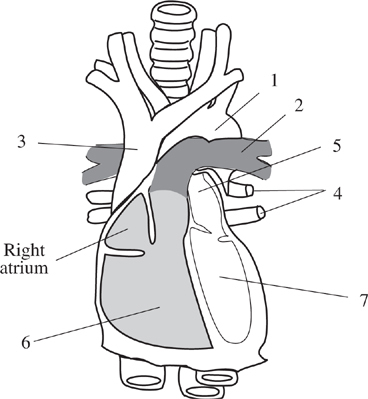 Which structure returns blood poor in oxygen to the heart? What type of molecule is depicted in the drawing above? 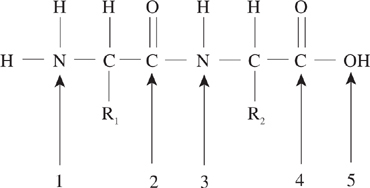 If we were to continue adding to this molecule to increase its size, to which atom would the next portion be bonded? Which of the following is the area of least productivity? 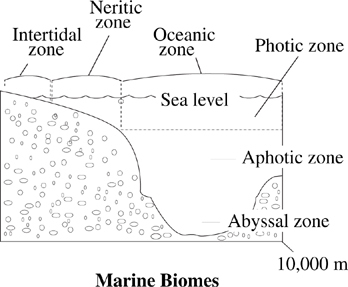 Organisms that live in the intertidal zone might have which of the following characteristics? 20. Because some fruits contain enzymes that act as proteases, various fruit extracts were tested for use as possible meat tenderizers. The extracts were tested over a range of pH values. 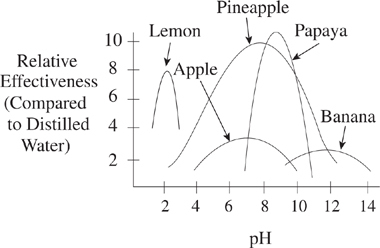 Below is a graph of relative effectiveness (compared to distilled water) vs. pH. Which fruit extract operates over the broadest pH range?